The musical form of a ballad is a song that tells a story, and it is often set to slow music. A ballad in the realm of poetry still tells a story but is not set to music. A ballad is a narrative poem made up of strong rhythm and rhyme and often includes repetition of certain lines. The ballad evolved and grew from several medieval roots, most notably Provencal folk music. The form had been known orally for centuries prior, with storytellers using the line breaks and rhythm to enrapture their audiences as they passed along tales and histories – many of them important to survival. A ballad tells a story and has specific rhythm, rhyme, and repetition. There are other key elements to look for. One is the presence of dialogue within the poem. 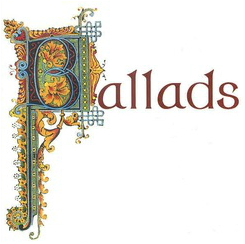 Just as stories generally feature dialogue among characters, so do most ballads. Also, the four-line stanzas have a set pattern: the first and third lines will have four beats, and the second and fourth lines will have three. Usually, the rhyme scheme will be ABCB, though ABAB is also acceptable. Here is an excerpt from the "Ballad of Birmingham" by Dudley Randall. This poem was based on the bombing of an Alabama church in 1963 in which four girls died. The complete poem is eight stanzas long. In these two stanzas you can pinpoint the rhyme scheme of ABCB, the 4-3-4-3 rhythm, and the dialogue. You can see that each stanza has four lines. If you read the entire poem, you will find repetitive lines in several of the stanzas. Here is another example: four stanzas from Felicia D. Hemans's ballad called "Casabianca." This poem is also based on a true story. The complete poem is made up of ten stanzas. The rhyme scheme differs from that of the "Ballad of Birmingham." Otherwise, this poem has the same rhythm. It contains quoted lines. It does not contain repetitive lines, but it does describe an action that is repeated three times.